Throughout this internship my lesson planning and adapting skills have grown. I have learned how to plan an engaging lesson, as well as learned how to adapt that lesson in many ways. From engaging students who are not interested in the media, to students who have different abilities. It has been challenging getting students interested and thinking about the context of projects and I think that is one area that I have grown most. Even if they are using markers and plain paper rather than the media being taught, I talk the student through questions to get them thinking about the content. I have found that most often students become engaged once they are able to connect the context to their own life. I am beginning to understand that in my role as an art educator I am responsible to teach about the elements and principles of design, art history, ect, but I am also responsible for connecting with each student. Taking the time to sit next to a student and help them with their art, but also ask about their day, or weekend. Some of the strongest connections I have made with students this semester have been when I sit next to them to help with their art, but also just listen to what they have to say. Connecting with the students is building a better classroom rapport, and helping me be more in tune with how to address classroom management and knowing why students might be misbehaving or what that students needs to get back on track. So far in the internship, I feel the most satisfied when I make a connection with a student or feel that I the students were engaged and absorbing the information. After leaving for the night, and reflecting on how that session went, I feel proud if I was able to manage a behavior situation or talk through a problem with a student. When we made bubble paper, the room was a disaster, but the students were well behaved, experimenting with materials, sharing ideas, and having so much fun. That was one of the most rewarding days, to see the students so engaged in their creations. I would definitely like to improve my classroom management skills. During the class students have a hard time interacting with each other in a positive way. I am currently and would like to continue to develop my classroom management skills in building a class community where students interact positively and support each other. I am not sure what to say in situations or how to redirect students into positive interaction. Another thing I want to develop more is knowing what will help students when the need time to regroup. First, I have learned more about classroom management and guidance for a class that is less structured than the internships before. There is still this management, but in a different way than teaching a new lesson every week. In addition, I have learned that demonstrations are still important even if the children are familiar with what they are doing. It is always good to remind them how much space should be between tiles, what colors go well together, etc. Having a class that is more free flowing taught me how to give important guidance, as well as taking a step back and letting the students learn through experience. For example, having them help pick what color a flower should be if the colors around it are more cool colors, and things of that nature. What made me the happiest about teaching this quarter was not only see the mural come to life, but also seeing how excited the children got seeing it grown, or even just finishing one flower. I would like to improve my classroom management by the end of the semester. This experience is giving me a different way of organization that I can apply to a more structured class as well, so I would really like to practice my skills in that area. I feel I have grown so much as a teacher. I have learned how hard lesson planning can go and the process of making needed materials. I have also learned that for older children classroom management can be more difficult. However, my experience has given me more confidence that I am in the right major. I really enjoy coming up with new ideas for lessons and seeing the children’s reactions to what they do. I also enjoy interacting with the kids each day. I have learned that some children will take more time to get through to and it pays to be persistent. I also am learning how important classroom management can be. Many kids who come to our class in the Boys and Girls Club have been at school and want to go home, so they are not always thrilled to be there. This means that I have to put in extra effort for them to enjoy our lessons. I also learned that some students enjoy messing around and trying to get a rise out of myself and Leona, which again emphasize classroom management. We are in charge of this placement and we need to have confidence in ourselves. We both understand that we will not always be the teacher every child loves. For the CFSC I understand that my role is not a lead teacher but an assistant teacher. It gives me great opportunities to see how I want to run my classroom. I can step back and be both an observer and assistant. I also enjoy interacting with the younger children. They are always happy to see me and always ask me to read to them and play with them. They are learning something with everything they do. I am a role model to them and I feel important to them. I also have become very aware of how the classroom works and the flow of the day. I am the happiest when students tell me that they are happy to see me or they had fun with our lesson. I feel like I’m doing my job and I’m making an impact in their lives. I understand that won’t always happen, but my goal is to make kids smile and learn without realizing it. I would like to work on going out of the box with some of my lessons. I want the students to explore different aspects of the internship descriptions that they may not have explored. I have grown because I think that I have gotten a little better at classroom management. I now understand the importance of setting boundaries in the beginning of the class so the students understand what we expect behavior wise. I have also gotten better at understanding that if someone is misbehaving it is probably for a reason other than just the class. Simply talking to them one on one and showing that you care can really make a difference in students attitudes. I have a better understanding about how important setting boundaries in the beginning is so you can start building relationships instead of worrying about behavior every day. I also learned that you can’t just be worried about being everyone’s friend because you won’t get anything accomplished and that’s not important anyways. What is important, though, is teaching and making sure the children understand what you are saying. What makes me happy about teaching is when the children get enthusiastic about what we have planned. I think it helps the day go a lot smoother and when they are excited about what we are doing they willingly participate which is great! It also makes me happy how well me and Leah work together, we are both super flexible with each other and the plans. I would like to keep improving my classroom management skills. I still struggle with that a lot. I would also like to improve my lesson planning and becoming more creative with ideas for the course. As a teacher, I have grown from this internship experience because it has given me a better understanding of how mosaics work and what the process is when you get closer to the end of a mosaic mural. We are hoping to get the mural done by the end of April, so seeing the final steps is really neat to see because this material is still very new to me. The new understandings that I have about children in the classroom of a mosaic mural is that it can be a little difficult because it is very easy to lose the children’s interest because they are so young. One of the things that I learned from this internship is that it is difficult to use mosaics with young children because they have a tendency to lose interest. I have learned that my role as the teacher in this specific classroom is to make sure the children are still learning, but also keeping the children on track so they don’t get distracted. One thing that has made me happy about teaching this semester is the fact that this mural is almost complete and it will be installed in the UW-Stout Library for years to come. Another thing that makes me happy is the excitement that the kids have when they get to come and make art out of an unusual material. One thing that I would like to work on improving by the end of the semester is getting the children to continue working on the mural without wanting a break or two during the work time. I have really grown as a teacher this semester considering how much I have gained in skills and understanding. I know so much more now about how a classroom operates efficiently. I feel like I have gained experience in classroom management just by having consistent experiences with the same groups of kids. I have really grown in my lesson planning skills as I have the chance to learn about the sort of things the children like doing. I love being able to tailor my lesson plans to their interests! So far in my internship, I feel like I have a very valuable role in the classroom. The students look forward to me coming in and ask me: "What art project are you doing with us today Miss Vanessa?". I have seen how beneficial it is for these children to have time to create something and express themselves creatively. I think art is a great opportunity for the children to make connections to their world. Plus they really enjoy it! It makes me happy seeing that the art projects I come in and do with the children make them happy. I love that the children get to express themselves through art. I also am happy about the great teachers I get to work with. I am happy to have the opportunity to learn from them and their experiences. Overall, I love being considered a valuable part of a great child care center! I feel like I have improved on a lot of things since I started my internship last semester. If I could choose something to improve on by the end of the semester, it would be my demonstrations. I want to be able to give the students demonstrations without them feeling like they need to make their art look exactly like mine. I try to choose activities that are very open- ended so the students can use their creativity as much as possible. I am lucky to have great students that listen attentively when I do give demonstrations, though. I find that they are always eager to learn new things! This internship has helped me grow as a teacher in many ways. I believe one of the biggest things it has done for me is helped me become more confident as a teacher and in my lessons. I have grown in both teaching lessons and addressing behaviors. Before I was nervous to take action when it came to addressing unwanted behaviors, however, I am now gaining the confidence to do this and take action. Through my internship I have been working with another pre-ECE teacher to plan and teach lessons. I have learned the importance of teamwork with teaching. Before I believed that teaching was something that you had to plan by yourself. Now through the internship I am understanding that communication with other teachers can be just as important as the work that you do directly with the children. The thing that makes me the happiest about teaching is seeing that the children get excited about the lessons I have planned for them. I love watching their faces light up when they are experiencing a lesson they enjoy doing. In the infant room I can even see that the infants get excited with new experiences that I provide for them. I would like to work on trying to find more of a variety of art lessons. I enjoy doing crafts with the children but have really only managed to do painting lessons. I have also only done a couple music and movement lessons, so adding some more of those types of lessons to step out of my comfort zone would be a goal of mine. In the beginning of this internship I was worried about classroom management and working with a new type of people. I feel that through this internship I have become much more confident and comfortable working with a more intimidating group of individuals. I have been able to adapt my way of teaching to work with inmates in a way that encourages their growth while respecting them as adults. I have learned when to put my foot down for classroom management and when to let some things slide, picking your battles is very important. Every day in this internship I am reminded that my job is not to assign projects and keep control, it is to guide in creativity. A lot of the times I get caught up in what I am teaching as far as skills but in this format of class there is such a wide range of skill level that I need to think more of the overall lesson as far as emotional growth in the project. I can then take time to work with small groups or individuals to build fundamental skills of art where it is needed. I am much less a teacher of skills but a facilitator of growth. Honestly I could have never expected this level of respect that I get from inmates. I came into this internship intimidated and found something that I am so passionate about. I want to look into this as a possible career in the future. This experience rekindled my excitement for teaching and gave me a wider view of possible futures. I would like to work on improving some of the participation in my class. There are some students who come in and simply refuse to do anything and I want this program to be available to people who actually want to grow. I want to create a way to monitor progress and to also give more of a significant recognition for completing the program. I have learned so much about working with children from different ages and how they interpret various instruction in different ways. I like how each Sunday the children come to class and are excited to see how the mosaic has progressed. I also like how I am able to show them different tiling methods. I have become more experienced with children who have a shorter attention span. This is evident in the multiple techniques I use to engage them in the activity. I also have grown in my knowledge and understanding of mosaics and because of that I am able to instruct the children more effectively. I love being able to see how much they have grown (skill-wise) over the semester. I have learned better ways to interact with children who are younger and have a more difficult time staying focused. I discovered that the students respond really well to encouragement and positive reinforcements, it helps them remain motivated to continue working on the project. I found that breaks can also help them by allowing them time to release their energy and when they come back from their short break, they are more focused. I like the fact that the children are excited to see me when they come to class, it makes me happy to know that I’m bringing them joy. Seeing the processes in which they work and create art is so much fun. I love seeing them be creative and coming up with unique ideas. I like hearing what they have to say about certain things as well, it’s interesting to see the world from a child’s perspective. I want to be able to learn even more strategies related to classroom management, especially because the class we are teaching is so unstructured. Sometimes it is challenging to keep the children under control and have them stay in a specific area as opposed to running around the library and making loud noises. I think having those tools will help me improve my abilities to teach challenging classes in the future. 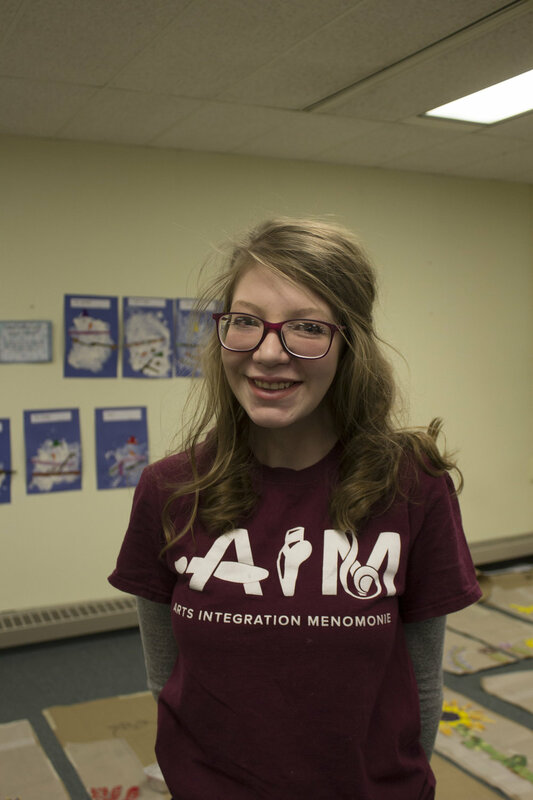 I had a P.A.I.N.T internship last year at the Child and Family Study Center, in the Why Room. This semester, I am back at the CFSC in the Why room and also the Wonder Room! Before P.A.I.N.T, I have had experience in schools in the Dominican Republic and England. I have also worked at a childcare center in Eau Claire and have had practicum/ lab experiences for my ECE classes. I am looking forward to being back in the Why Room to help the children build on the skills they learned last semester and also getting experience with a new age group in the Wonder Room! From what I can tell so far, the children are very creative, and I am looking forward to doing some fun projects with them this semester. I hope to learn more about the developmental differences between 3 and 4 year olds through my lesson planning and being able to adapt those lessons accordingly. I think I will learn a lot about myself and my teaching style this semester and I am very excited about that! Today I had my first day of teaching at the jail and it went better than I expected. 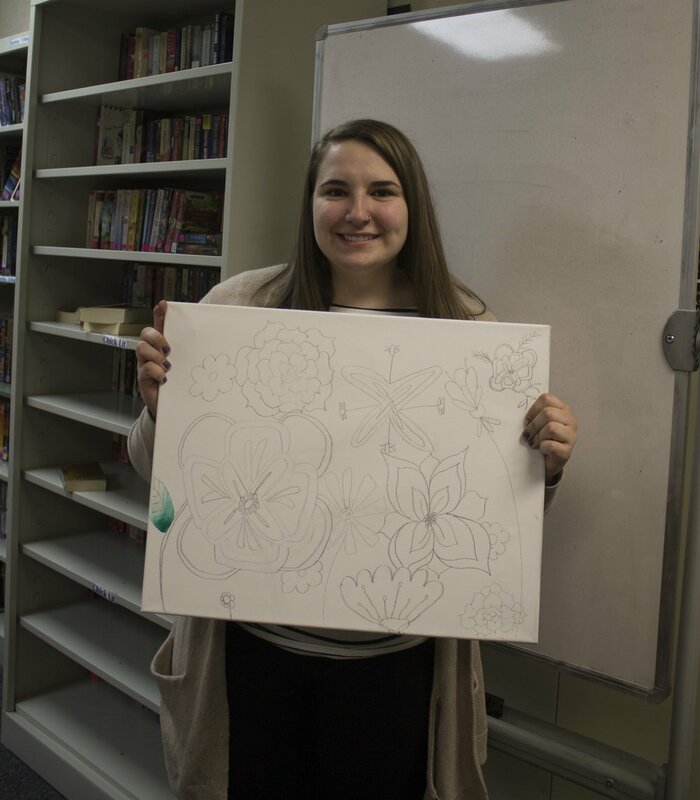 Sara was very relaxed and flexible with her work style which makes me feel more comfortable coming in later in the semester and also seems to make the inmates more comfortable to express themselves rather than trying to do a project “right”. 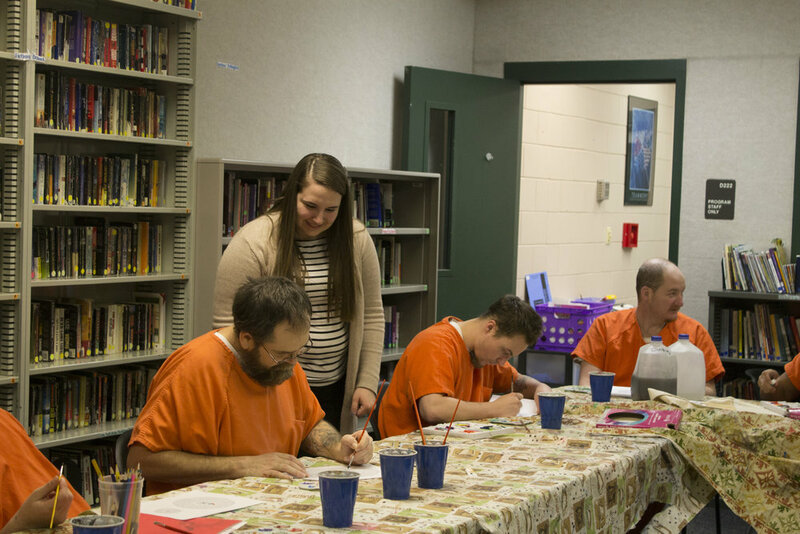 I got to take part in the inmates creating a group project on canvas and watch the flow of the class. I loved the conversations that were had and the general feel in the classroom. It felt like an open environment and a safe space. I look forward to creating new and exciting art projects to help the inmates to express themselves. I want to give these people an outlet to express themselves with what gives them a sort of purpose and helps them see that they can be productive members of society. From talking with the inmates that were in this class I could really tell how the art helped them see their past, present, and future. I would like to learn more about how to work with unconventional classrooms. This will give me an experience to become comfortable working with people that I have little familiarity with and learn how to talk with people from a wider range of backgrounds. I mostly would like to learn more about how I can help others and figure out if working in a jail rehabilitation environment would be a good setting for me in the future. I have not started teaching yet. I have only been in the two year old room for a couple hours and I have been assisting with the lead teacher’s lesson and have been playing with the children during free time. Last semester I did the same internship and I taught two lessons. I taught an art lesson and a dramatic play lesson. I taught both lessons to the one year olds and two year olds. Other than that I have not had any teaching experience. I am looking forward to gaining some new experiences with working with a new set of children. Working with infants is going to be a challenge this semester but I will have to be creative in my ways of planning and adjusting lessons. 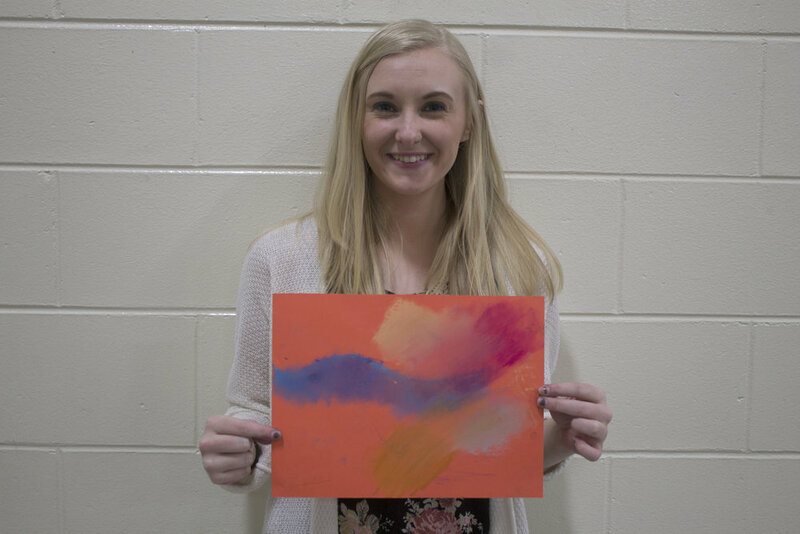 Another thing that I am looking forward to is being able to co-teach lessons with another PAINT intern. I think this way the lessons we teach the two year olds will be much stronger. I hope I learn how to be more creative in my lessons. Last semester I feel like I was not very creative in my lesson planning so hopefully gaining even more experience will help with my creativity. I also hope that I will be able to gain better communication skills by planning lessons with the other PAINT intern and working with the lead teachers. Being able to gain some classroom management skills would also be a great thing to gain during this experience. So far, I have had a few of teaching experiences with the A.I.M. program. 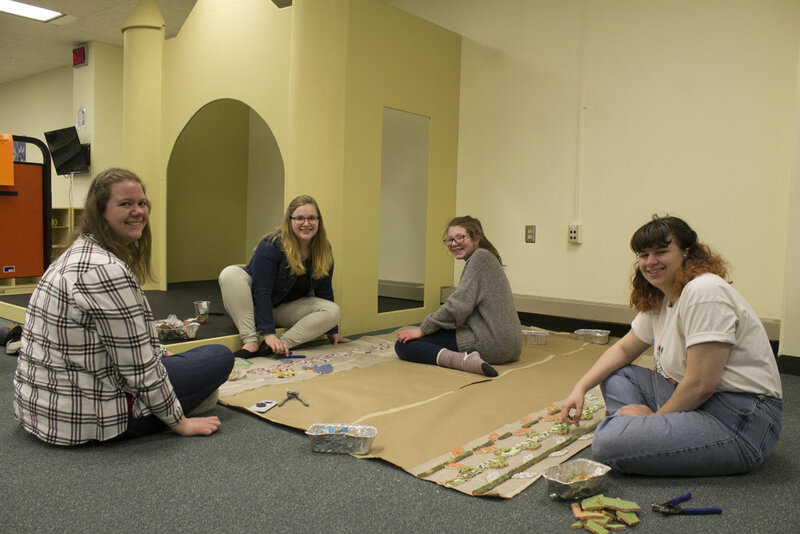 In spring of 2017, I taught the Jumpstart program and this past fall I participated with a group teaching the mosaic mural project at the library. I have also been given the opportunity to go to the children’s school on campus and create artistic projects with them. I look forward to being able to create a mosaic mural that will be a permanent piece in the library. I worked on it last semester and it’s so amazing to see how everyone’s piece that they worked on come together. I am excited to teach others about how to create mosaic artwork as well. The process of creating the mural is so transformative and everyone has a unique perspective when working on it. I hope to be able to learn how to create better color coordinating designs within a large piece of artwork. I also anticipate that I will be able to learn more about creative problem solving. We are trying to decide what color to apply to the background to make it look cohesive, but not have the flower stems blend in. I also want to learn more about the mosaic creation process, specifically about the application of it to the wall. This is a relatively new medium to me and I hope that throughout this semester I can learn more about the process so that I can potentially do something like it in the future on my own.